What is the first thing you encounter when you close your eyes? Blackness. When you enter your inner world, you enter into darkness. This is the first experience, and the first stage of the Great Work. here the operation of putrefaction takes place. Here the fixed gets dissolved by the volatile. By becoming aware of the volatile mind, the bodily consciousness diminishes. 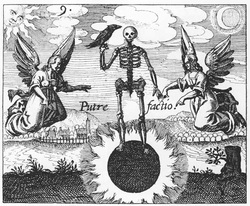 In alchemical symbols Nigredo is always indicated by something black: the raven, the raven's head, the dark jacket, darkness, the night, the Solar or Moon eclipse, the tomb, hell, and death. When the Matter has entered the stage of blackness, it is called lead or Saturn, or the head of Moorish one. Putrefaction, the process during the phase of blackness. In the picture a skeleton and a black raven. The cut off tree stump to the right is a symbol that sometimes appears in alchemical engravings to symbolize that the old self has to be cut off and a new self will spring up (the new growth symbolized by the fresh sprout on the trunk). The skeleton is standing on an eclipsed sun. The sun is the Inner Light, the Divine Self, that is hidden by the blackness of our every day, normal behaviour and being. It is obscured by the physical consciousness we all have. Therefore that what obscured our Divine Self has to be putrefied and purified in order for the Divine Self to shine in all its glory. The white dove is a symbol for the stage of Whiteness or Albedo. Often the early stages of this are shown as being in a bath or vat of water. Becoming aware of your inner world, is like being in water. 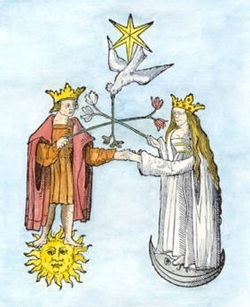 In this picture the King and Queen, or Sulphur and Mercury, or Moon and Sun have been elevated into the air. Here they have attained the state of Whiteness or Albedo, indicated by the white dove, and the star. This is the perfect putrefaction, when all blackness has disappeared and the colour white appears. Then it is said that life has conquered death, that the king has been revived, that earth and water has become air, that the child has been born, that Heaven (the Volatile, the Female) and Earth (the Fixed, the Male) have married. It is the realm of the Moon. When one has purified there awareness of Self, during meditation, by eliminating thoughts, or otherwise, then at a certain point, light appears. This can be but is not necessary a visual light inside oneself. The light that appears is also metaphoric for an absolute clear, pure awareness of Self. It is something that cannot be described. One does not indeed experience the darkness anymore that is there when one closes the eyes. Alchemists say that in Whiteness, the Matter has attained a degree of Fixedness that fire cannot destroy. In that state one is in a very fixed position, that is, very stable, very much in the here and now, in total clarity of Self. Philosophers say that when one has attained this stage, one needs to destroy the books because they become superfluous. From this point on one needs to continue this purification of awareness to the next stage of yellowness. Citrinitas – the yellowness; the solar dawn or awakening. Now the light is no longer reflective as in the lunar light of Albedo. Its nature is direct and it is all pervading. 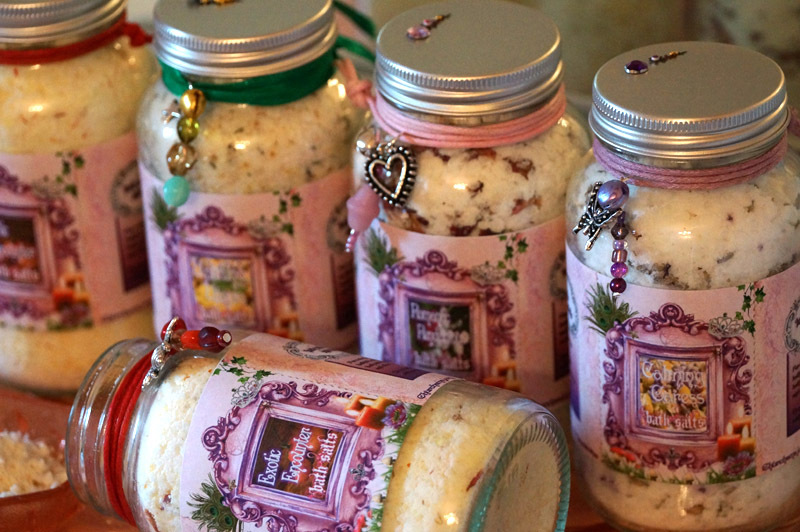 It is sometimes referred to as the original Light or the Light that is pure, creative Intelligence. It is said that the only true knowledge is revealed to us when this Light becomes conscious in us. Stage three begins with the "yellow death". There is a dying away of the "lunar light" to the point of complete darkness, which is in fact "black light," a light so bright we cannot see it as our inner sight is veiled and it appears as darkness. It is a complete dying of the dualistic state of mind that perceives subject and object as separate. The "yellow death" signals the end of the influence of the "lunar light," as the consciousness is transformed into "solar light." This "solar light" awakens the sense of revelation and revelatory knowledge. Inner knowing is not arrived at by study, reflection or deep thought; it is to be experienced as a direct revelation. Since stage three has moved clearly into the mystical realms, there is no way to describe this, it has to be experienced. However, the intuitive knowledge that we often receive in life, whether in a dream or in a flash of realisation, gives us at least a hint of the power of the "revelatory light" or "solar light." In this sense, we could say that our intuition is an expression of the eternal mystical knowledge, a level at which everything is already known. This is referred to as Pure Intelligence. Our Higher Self provides this intuition. In order to know something of this stage we must rely on the illuminations of those exceptional few human beings who have recorded their experiences. The fourth and last phase is characterized by the colour red. When the yellowness has been made, it needs to purified further, sublimated, until the Matter becomes totally Fixed and is completely stable. Then we have the Red Sulphur, the red stone, the Red Elixir, the Stone of the Wise. When the Divine Light (Theolalite) has emerged during meditation, one needs to make it last. This demands a continued effort of holding one's attention to this pure awareness, not only for the length of the meditation session, but also during every day life. At a certain point the pure awareness of one's Divine Self (Theolalite) will be permanent. This time a winged Sun figure rising from a tomb. The tomb is a often used symbol for the phase of Blackness. The figure to the right is the Goddess Diana, a symbol for the second phase of Whiteness, symbolized by the Moon. 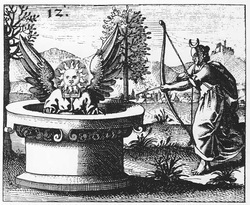 The figure on the left is the God, symbolized by the Sun of the third phase of Yellowness. The bow and arrow is a symbol for Fixing the volatile. In other words when Yellowness has been reached, one needs to Fix the Matter (like an arrow pins down something) until it become totally Fixed. Reading the above it might seem obvious how religions have used the alchemical process Jesus went through and taken it literally. 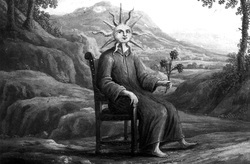 The alchemical process is played out by our Sun everyday and on a larger scale every year. It is born, it dies when the Moon comes out and is reborn. The same way Jesus was born a King, he lived a pure life, and he met Mary Magdalene his Queen (Moon/White Dove), the two merged during Hieros Gamos (the star) where his all old self dies and he found his Inner Light. He then rises from his tomb reborn - illuminated.